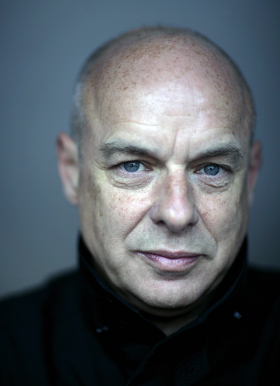 Brian Eno or simply Eno is an English musician, composer, record producer, singer, and visual artist, known as one of the principal innovators of ambient music. Eno's solo music has explored more experimental musical styles and ambient music. It has also been immensely influential, pioneering ambient and generative music, innovating production techniques, and emphasising "theory over practice." He also introduced the concept of chance music to popular audiences, partially through collaborations with other musicians. Eno has also worked as an influential music and album producer. By the end of the 1970s, Eno had worked with Robert Fripp on the LPs No Pussyfooting and Evening Star, David Bowie on the seminal "Berlin Trilogy" and helped popularise the American band Devo and the punk-influenced "No Wave" genre. He produced and performed on three albums by Talking Heads, including Remain in Light (1980), and produced seven albums for U2, including The Joshua Tree (1987). Eno has also worked on records by James, Laurie Anderson, Coldplay, Paul Simon, Grace Jones, James Blake and Slowdive, among others. I believe in singing to such an extent that, if I were asked to redesign the British educational system, I would start by insisting that group singing becomes a central part of the daily routine. I believe it builds character and, more than anything else, encourages a taste for cooperation with others. The earliest paintings I loved were always the most non-referential paintings you can imagine, by painters such as Mondrian. I was thrilled by them because they didn't refer to anything else. They stood alone, and they were just charged magic objects that did not get their strength from being connected to anything else.